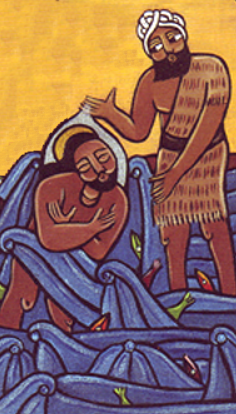 Today we celebrate the baptism of Jesus. In it we find the gospel in a nutshell. by the gift of water. calling forth order and life. giving righteousness a new beginning. into the freedom of the promised land. and anointed with your Spirit. and opened the way to eternal life. We thank you, O God, for the water of baptism. through it we are reborn by the power of the Holy Spirit. Water is powerful. Water can be chaotic, threatening, and destructive; and water nourishes, sustains, and protects life – in the womb, and the sea, and all over the earth. Water floods and flows, giving life and taking lives. Water is powerful. A river runs through life from the beginning of creation to the city of God. Today we celebrate that Jesus stepped into that river. John the baptizer appeared in the wilderness, and a lot of people from Jerusalem and the countryside were heading down to the banks of the Jordan to listen to John’s preaching and to be baptized by him, confessing their sins. One by one they stepped into the water. They could smell wild honey on John’s breath, they could see the light in his eyes as they said what needed to be said. Then they let his strong, sun-burned arms plunge them beneath the surface, into the silent depth of the old river. Their ancestors once entered the promised land crossing this river; it marked the border between the wilderness and the home of God’s people. The men and women who came to John wanted to be worthy of being counted among God’s people, worthy to live in the land of God’s promise. They prayed that the river would wash away their sins, and that they would emerge from the chilly depth with their lives scrubbed clean, prepared to face the day of the Lord. Jesus began his ministry where sinners gathered, and he came like the rest of them had come, walking on dusty roads and down to the river’s edge, waiting in line in the heat of the day, and finally stepping into the water to be baptized, like the rest of them. Such a crowd was gathered at the river, you couldn’t have picked him out from the many faces, and the way Mark tells the story, neither could John. Standing in the water, he didn’t realize that his arms were holding the one whose coming he had been announcing. He plunged him beneath the surface, into the cold silence, down into the darkness at the bottom. The beginning of the good news of Jesus Christ, the Son of God. Water, Spirit, and a voice. As in the beginning when God created the heavens and the earth: darkness covered the face of the deep and a wind from God swept over the face of the waters, and God said: Let there be light! And there was light. And God saw that the light was good and called it Day. The beginning of the good news is like the beginning of creation, and it is a new creation: water, Spirit, and the voice of the One who creates, beholds, and names. God saw that the light was good. Earth and sea were good. Plants and trees were good. Sun and moon and stars were good. Fish and birds, cattle, creeping things, and wild animals of every kind were good. God saw everything that God had made, and indeed, it was very good. God was delighted. And when Jesus emerged from below the face of the deep, God was delighted. It was a new beginning for the world, a new day. Mark doesn’t tell us a Christmas story of Jesus’ wondrous birth. Mark is the most economical of story tellers: no genealogy, very little biographical detail; all he tells us is, “In those days Jesus came from Nazareth of Galilee and was baptized by John in the Jordan.” Everything is pared down to the essentials: Jesus, the one who would baptize with the Holy Spirit, enters the water and is himself baptized – acting in radical solidarity with all human beings, disappearing in the deep, not to be washed, but to drown and rise. In his baptism we find the gospel in a nutshell. This is where he comes from and where the heavens are torn apart never to be closed again above the earth. Listen to this; it’s from a psalm in which God addresses the king: You are my son; today I have begotten you. Ask of me, and I will make the nations your heritage, and the ends of the earth your possession; you shall break them with a rod of iron. Many scholars believe that this psalm used to be recited at the coronation of Israel’s king. It speaks of the king as God’s son, which was a rather common idea among ancient cultures. The voice from heaven doesn’t quote the psalm word for word, but there is enough of an echo for us to hear Jesus of Nazareth being crowned with royal authority. Jesus is the servant king who rules not with an iron rod but with words of authority and deeds of healing. He is a king in solidarity with his people, the chosen servant who entered the river with us. He is in the water with us, disappearing in the deep, not to be washed, but to drown and rise. He is in the water with us, to bring to an end all that keeps us from abundant living and make a new beginning. When we are baptized into Christ, we die with him and rise into newness; his life becomes our life, his story our story, his way our way. We emerge from the waters assured of our identity as God’s beloved sons and daughters, assured of our kinship with God and with each other and with all those on the river banks hoping for a new beginning. The Son of God came that we might know who and whose we are, know it not just in our minds, but hear that voice in our proud and fearful hearts, “You are my child, my beloved, my delight.” No matter who you thought you were before you were immersed in the death and life of Christ, remember this, I have made you my own. “Oh, yes!” she would say, and then the class could go back to their discussion. This is how Janet describes the day of Fayette’s baptism. Fayette went under, came up spluttering, and cried, ‘And now I am…?’ And we all sang, ‘Beloved, precious child of God, and beautiful to behold.’ ‘Oh, yes!’ she shouted as she danced all around the fellowship hall. Fayette’s story breaks my heart, but I am in awe of how she clung to her identity as a precious child of God. She had been in the heart of the sea, and the waters raged and roared and the waves overwhelmed her violently, body and soul, but by the grace of God she remembered.